Every week, baking expert Alice Medrich is going rogue on Food52 -- with shortcuts, hacks, and game-changing recipes. 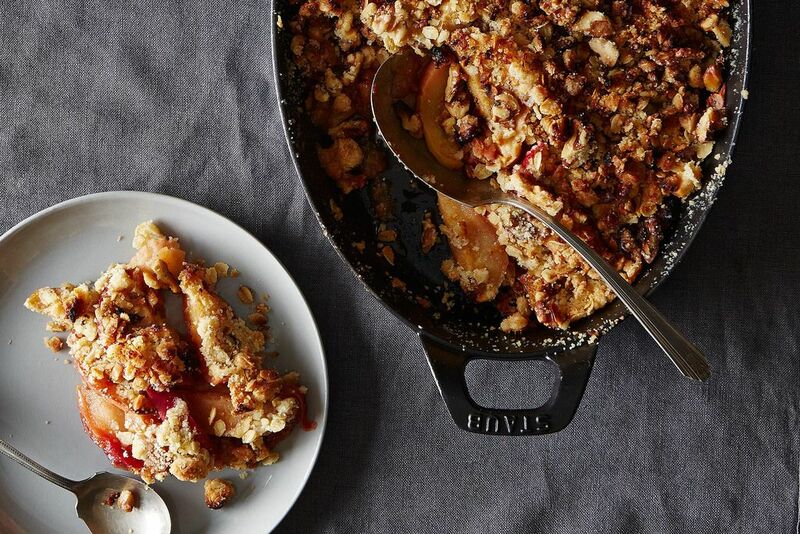 Today: A low-key apple crisp for Thanksgiving and beyond. This is your rabbit-from-a-hat when you have no time to make a "proper" pie -- or if you are scared silly of making pie crust in the first place. But this is no second best; it’s a star in its own right and far better than most apple pies! I leave the skins on the apples, as my mother did, because they add flavor and body to the filling. Choose apples from the farmers market or get the produce guy in your market to let you sample before buying. If you include some red apples, the filling will have a gorgeous rosy hue. In a hurry? 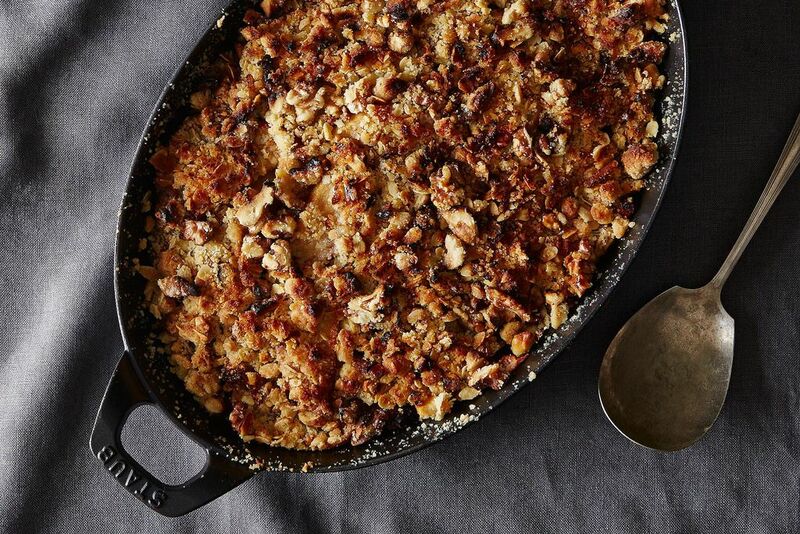 Skip the dried apricots and orange zest and juice (as my daughter used to do in college). The crisp is terrific warm or at room temperature, but it is especially flavorful cold -- even after two or three or four days in the fridge. I know this because I make multiple recipes the day before Thanksgiving every year, also as my mother always did, so we can eat apple crisp after as many meals as possible (and before bed for as many days as possible). Whipped cream is always nice, but not essential. Get excited about Alice's new book Flavor Flours: nearly 125 recipes -- from Double Oatmeal Cookies to Buckwheat Gingerbread -- made with wheat flour alternatives like rice flour, oat flour, corn flour, sorghum flour, and teff (not only because they're gluten-free, but for an extra dimension of flavor, too). I've made apple desserts without peeling them for years and they are delicious ! My apple crisp is much like yours but I add different small amounts of fruit depending on what I have such as fresh or dried cranberries or wild huckleberries. For our granddaughter I bake a gluten free( due to celiac diagnosis) recipe which I made up as the recipes I saw in books 11 years ago were awful. I want to make this as gluten free as well. Dorian, can you suggest a good mix of gluten free flours to use? Thanks in advance! Kim, any of the cup for cup gluten free flours will work well.